In both beef and dairy herds, accurate pregnancy diagnosis is the cornerstone of effective management practices. Dairy herds rely on accurate pregnancy test results to plan for the coming season. 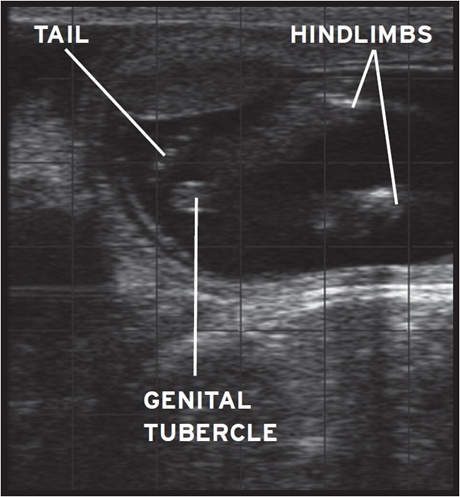 For many years, rectal palpation has been the gold standard of pregnancy diagnosis. Ultrasound pregnancy testing is faster and more accurate than rectal pregnancy testing. 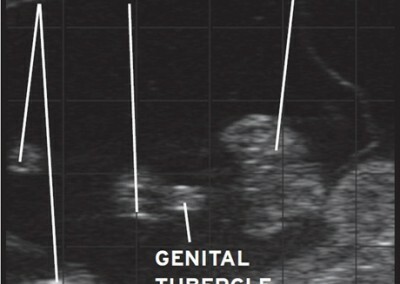 Ultrasound can also identify twins and an infected uterus. 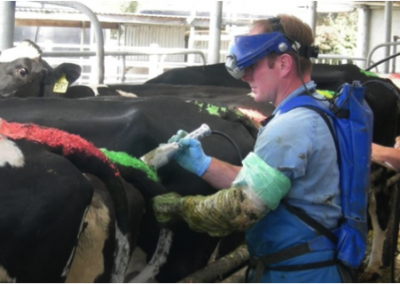 Warrnambool Veterinary has several vets NCPD accredited in ultrasound pregnancy testing, an Australian Cattle Vet scheme that guarantees accuracy through examination of vets pregnancy testing. In most circumstances we will use a combination of both methods to pregnancy test your cows. 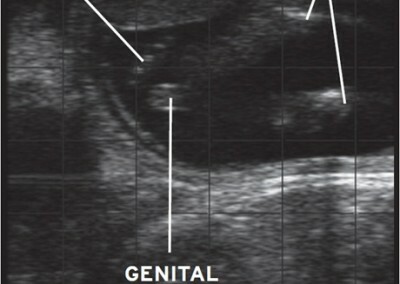 Foetal sexing during pregnancy testing is the determination of the gender of the foetus. Foetal sexing can have various applications for farmers. Some of these include identifying whether potential cull cows (ie. high cell count, old cows, late calving cows) are carrying a female foetus, so they can be kept at least until they calve. Cows need to be presented when they’re between 8 and 13 weeks in calf. 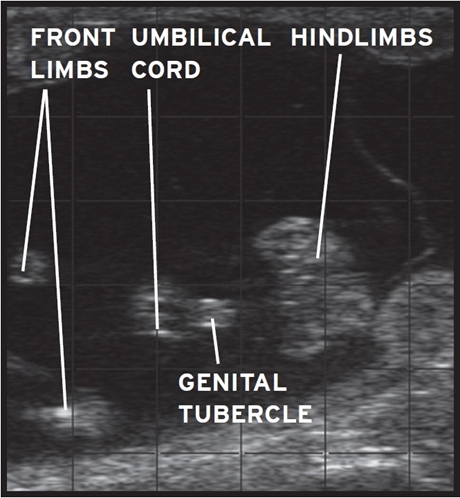 The lower limit exists because the foetus’ sexual characteristics only become apparent on ultrasound at this point and the upper limit is due to the foetus becoming too large to visualise and the uterus dropping over the pelvic brim, making scanning difficult. ?Foetal sexing does not need to be limited these situations. Basically, any cows can be presented. Perhaps you simply want to know if Bessie is going to have a heifer calf this year! Naturally, foetal sexing takes more time than regular pregnancy testing. Currently the speed is about 40 cows per hour (using an AI race or rotary dairy) but in time this number will increase. 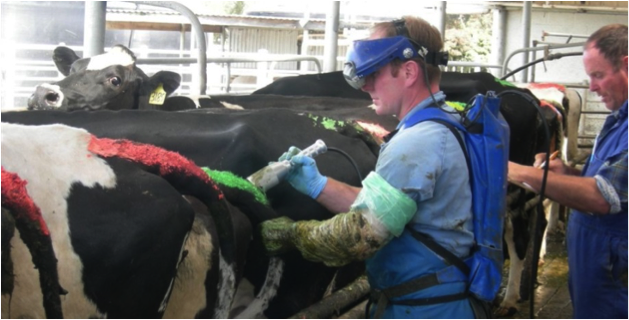 Foetal sexing is a specialised skill requiring a specific type of ultrasound, so if you wish to present certain cows for foetal sexing, be sure to advise our staff when you book your pregnancy testing job. WHY PREGNANCY TEST EARLY THEN? Whilst we can tell you yes (pregnant) or no (not pregnant or empty) later on, to efficiently run your dairy farm, you need to know what stage of gestation the cows are. > From 6 to 16 weeks of pregnancy we are very accurate. > Above 16 weeks, the accuracy is reduced. To get the most information try to present cows for preg testing when they are between 6 and 16 weeks pregnant. > Test 6 to 7 weeks after the end of AI. > Test 6 to 7 weeks after the bull is removed. Good facilities are quicker, safer and less stressful. Talk to us about the design of a vet (AI) race or stand for a rotary if you do not have one. A list of AI dates converted to the number of weeks pregnant at the time of preg testing optimizes pregnancy testing accuracy. Computerised herd health programs, such as Dairy Data, are of great assistance in this area. Speak to us about converting your joining or herd test data into a readily usable report via Dairy Data. Cow identification needs to be accurate, easy to read, not have 2 or more cows with the same identification and not have cows with no identification. The pregnancy testing results need to be recorded accurately. Recording results is not an easy job – the person doing that job cannot do other jobs. If the cow identification is difficult to read, then the recorders job is more difficult. If you do not have a spare person to record results, let us know and we can bring an extra person to record. HOW CAN I MAKE MORE USE OF PREGNANCY TESTING RESULTS? As well as deciding empty cows, knowing when cows are going to calve lets you plan for the next season. Inducing late cows 10-12 weeks prior to their expected calving dates gives the best chance of bringing these cows in line with those calving to A.I. and therefore tightening up the calving period. Knowing how many empty cows you have allows you to calculate how many other cows you can afford to cull. A feed budget is an accurate assessment of the herd’s future feed requirements compared to feed availability. An accurate predicted calving pattern is required for the calculation of a feed budget. You have spent a lot of money on joining your cows – how do your results compare? A danger in talking about figures with other farmers is that you are often comparing apples with oranges. For example comparing how many empty cows you have compared to another farm is meaningless, if you joined for 10 weeks and they joined for 20 weeks.